We want the Boardwalk Catalog to be a useful place to you, so we're always on the lookout for great sites that will give you the information you need to enjoy that shore atmosphere all year round. Let us know if there are links we should include, and keep coming back as these pages grow. Did you know there's some great baseball near the shore? Check out the Lakewood Blue Claws. Everything you never wanted to know about Beach Tags can be found here. More and more shore communities are offering special services for the physically challenged, such as the Beachwheels Program. There's something special about staying at a Bed & Breakfast. We list over 100 of them. 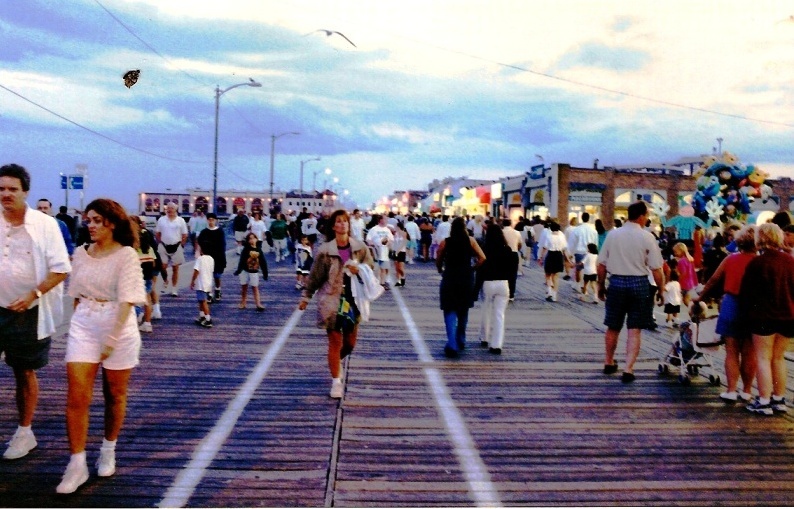 What can be more fun than The Boardwalk at Night ? Check out some of our pictures. Attention Boaters: check out current conditions including tides and weather at our Boating Resources page. Looking for a book for the beach? The Boardwalk Bookstore has a great selection. Are you looking for a Campground in the Shore area? Check our listings. A ride on the Cape May - Lewes Ferry can make for an enjoyable day. The Cape May County Zoo is well worth a visit, and truly a place for the whole family to enjoy. Like historical settings? Historic Cold Spring Village in Cape May is worth a visit. Fishing, Boating and Whale Watching are great activities at the shore. Which Exit? Find the exit to your favorite town on the Garden State Parkway. Golfing at the Shore.There are some fine public courses. Looking for natural splendor? Check out Island Beach State Park. Interested in Lighthouses? Jersey has some of the finest. An interesting link to New Jersey's past is Lucy the Elephant. Not too sure where a town is located? Check our Map of the Jersey Shore. Looking for a Marina for your boat? The Marine Mammal Stranding Center in Brigantine does some important work. Looking for a Motel or Hotel ? Check our listings of hundreds of places to stay at the Jersey Shore. Planning on doing some outdoor cooking this summer? We've prepared a page of cook books to help you create those gourmet grill delights. Looking for the sounds? Check out the radio stations at the Jersey Shore. Does summer get you humming some of those beach songs? Check out our song lyrics page to get the words. We offer some pretty nifty stock photos of the Jersey Shore. Hitting the beach? Be sure to follow some basic tips to avoid sunburn. There's some decent surfing at the Jersey shore. Check out our listing of surfing beaches. Transportation: Getting to the Jersey Shore other than by car, check out New Jersey Transit or the Atlantic City Airport.. Need a Town Map? Click Here. The new Tuckerton Seaport offers a glimpse of New Jersey's maritime heritage. If you are like history, and are looking for something a little different, check out the SS Atlantus , the site of The Hindenburg disaster in Lakehurst, the story of the Morro Castle, or the Wildwood Revolutionary War Battle of Turtle Gut. If you are up in the Sea Girt area, check out the National Guard Militia Museum. The Wetlands Institute studies New Jersey's valuable wetlands. Interesting places not at the shore.